How do I re-connect my Gmail account via Single Click when it's been disconnected? Got your Google Mail account disconnected from Reply.io? Don't worry, here's how you can quickly reconnect it & proceed with your campaigns. Once your Gmail account has been permanently disconnected from Reply due to an error (e.g. Invalid credentials), you need to connect it back. You cannot connect the same email address twice, so you need to remove the one which is disconnected from the list. There is only one email account connected, it's default and it's red. Click the Add button (+) and add some random email account (or select Other and put any values into mandatory fields and save). Make this fake email account your Default account. Delete your actual email account, which has been disconnected, from the list. Use the Add button (+) to connect it again via the Gmail option and make it Default. Delete the fake email account. 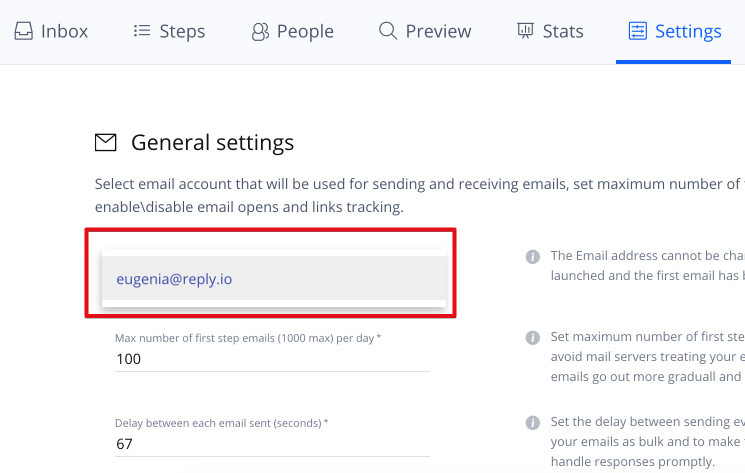 Go to your campaign -> settings and re-assign the email account for sending. You have multiple email accounts connected, the one you need to reconnect is Default. Once it's done, make it Default as shown on the picture below. Remove the disconnected (red) email account. Connect the Gmail account via Single Click again by using the Add (+) button. Go to your campaign -> Settings and re-assign email account for sending. The campaign will be resumed within 10-15 minutes according to your Schedule.